Pre-orders for the S9 and S9+ are now live, and the links have been added to this post. The Galaxy S9 and S9+ are both official now, but there's still the pesky question of where to pick one up. You can always go the unlocked route, but carrier deals can present a decent discount. Plus, you've got aesthetics to take into consideration. Will this retailer have that color? And where can you grab it first? If you can't focus past the adjustable aperture in your enthusiasm for Samsung's latest, don't worry. We've got those details here. In the U.S., Galaxy S9 and Galaxy S9+ will be offered in Lilac Purple, Midnight Black and Coral Blue for carrier and Unlocked by Samsung versions. Preorders begin March 2, 2018. AT&T, Sprint, T-Mobile, U.S. Cellular, Verizon Wireless and Xfinity mobile will carry Galaxy S9 and Galaxy S9+ in stores beginning March 16, 2018, as well as at Best Buy stores and BestBuy.com, Amazon, Costco, Sam’s Club, Target and Walmart. Cricket Wireless and MetroPCS will offer Galaxy S9 and S9+ in Midnight Black. Samsung Galaxy S9 Enterprise Edition will be available in Midnight Black. The new devices will be available beginning March 16, 2018. Available through Samsung.com and the Shop Samsung app, the Unlocked Galaxy S9 is $719.99 or $30/month for 24 months financing, and the larger Unlocked Galaxy S9+ is available for $839.99 or $35/month for 24 months financing. Starting March 2, 2018, consumers who pre-order a Samsung Galaxy S9 or Galaxy S9+ can save up to $350 with qualifying trade-in. The promotion will last for a limited time and is available at Samsung.com, the Shop Samsung app and select retailers. Visitsamsung.com/us/trade-in for more information. The statement gives some detail about the retailers and carriers stateside that plan to sling the S9 and S9+, and it includes unlocked pricing, but not carrier-related details. Thanks to the terror/magic of carrier-subsidies, that's gonna vary. Ma Bell AT&T plans on stocking the S9. If payment plans are your style, you can pick up an S9 via AT&T Next for $26.34 a month over 30 months (a cumulative $790.20), or the dual-camera S9+ for $30.50 a month over the same period ($915), excluding taxes. Outright pricing through AT&T hasn't been disclosed—AT&T probably prefers not to say in the hopes that customers will remain tied in service for longer periods via payment plans. But it should be nearly identical to the cumulative pricing above, so around $790.20 for the S9, and $915 for the S9 plus. It also hasn't disclosed any trade-in or accessory promotions in relation to the S9 and S9+. Sprint, like all the other major carriers, will be entirely too happy to sell you a Galaxy S9 or S9+, especially if you can rationalize doing so on a payment plan. Sprint's runs $33 a month for the S9, and $38 a month for the S9+, with outright pricing around $792 and $912. Like previous phones, the Galaxy Forever program is available and included with all S9 and S9+ purchases, so you can continuously upgrade via monthly payments if that's your thing. Sprint will have the phones in Midnight Black, Coral Blue, and Lilac Purple, with pre-orders opening March 2nd, and purchases on March 16th. Sprint is also selling the phones through Boost Mobile, probably with similar terms, but more limited color availability: just black. For more details, check out the full PR. The house of Legere will also supply interested parties with Samsung's new flagship. For $30 a month you can pick up either phone on T-Mobile's Equipment Installment Plan, but the S9+ will cost you an extra $150 up front. Either can also be purchased outright, with the smaller S9 running $720, and the S9+ $840. (That's the same price that the monthly payments work out to, FYI.) Postpaid voice and business customers can also get up to $360 off a maximum of twelve of the phones on trade-in with the discount being returned by billing credit over 24 months (among other terms and conditions). T-Mobile will stock both phones in the colors Midnight Black, Lilac Purple, and Coral Blue, and you can pre-order them beginning on March 1st at 9:01PM PT (or March 2nd in ET, like all the other carriers), with stock hitting stores on March 16th. You can sign up for related notifications here, and T-Mobile's full press release on the subject is just over here. If you want to pick up an S9 or S9+ from US Cellular, it hasn't announced specific pricing just yet, but it's running the same trade-in promo for up to $350 off that the other carriers and Samsung are doing, with financing available. Unlike the other carriers, US Cellular is also running a few accessory-related promos. You can grab your phone together with a power bundle that gets you a wireless charger, car charger, and portable battery for an extra $124.99 (with financing available). Pre-orders start on March 2nd, like everyone else, and US Cellular will offer the phone in Midnight Black, Coral Blue, and Lilac Purple, with in-store and general availably on March 16th. Like every other carrier, Verizon will be happy to sell you the Galaxy S9 and S9+. Big Red's pricing runs $33.33 a month for 24 months in the case of the S9 and $38.74 over the same period for the larger S9+. Just as the monthly costs at Verizon run a bit more expensive, so too is the outright pricing, with the S9 and S9+ retailing for $799.99 and $929.99, respectively. Like T-Mobile, Verizon is also running a trade-in promotion—alternately claiming $500-$350 off eligible phones. Like T-Mobile, it's in the form of a bill credit, with terms attached. Verizon Up Customers with an active Samsung smartphone will get $10 off select Samsung accessories. For the full details, you can check out Verizon's announcement. Samsung directly announced sales at Best Buy (store and site), Amazon, Costco, Sam's Club, Target, and Walmart beginning on March 16th, but other retailers will probably also get in on the action. It remains to be seen which participating retailers will be involved in pre-orders, though. You'll also be able to pre-order directly from Samsung's online store. Samsung plans on selling the handset directly for the same prices as last year's S8 and S8+, at $719.99 in the case of the smaller S9 and $839.99 for the larger S9+, with financing options available ($30/month for 24 months and $35/month for 24 months). Samsung also has a trade-in plan, like last year, which can save you up to $350 if you're willing to give up a qualifying handset. Starting March 2, AT&T* consumers and businesses can preorder the Samsung Galaxy S9/S9+. You can pick up the new smartphones in our stores on March 16. And, later this March, they will be available to FirstNet users, providing the functionality first responders deserve. Today’s cameras are for more than taking pictures – they’re for connecting and communicating. Consumers want a smartphone camera with state-of-the-art technology to tell their own, unique story. Super Slow-mo – Make every day moments epic with dynamic, slow-motion video that captures 960 frames per second. AR Emoji – With augmented reality tools, you can create an emoji that looks, sounds and acts just like you. Dual Camera – The Dual Optical Image stabilization on both lenses lets you capture crisp photos with less motion blur, even if you’re shooting in the dark or from a distance. Clear Zoom – Capture crisp photos when you zoom in from a distance. Live Focus – Focus on what you want and adjust the amount of background blur in your photo. You can even preview what the image will look like before you snap the picture. We’re also bringing first responders the tech upgrades they need with FirstNet – the country’s first and only communications platform dedicated to public safety. By the end of March, first responders subscribing to FirstNet will be able to add the Galaxy S9/S9+ to the list of tools they can use to safely and effectively respond to emergencies. The Galaxy S9/S9+ will let first responders tap into the full FirstNet experience, delivering a reliable, highly secure and always-on connection to the critical information they need. The Galaxy S9/S9+ is also the first Samsung device with built-in Band 14 access, the new frequency band that will be built out for FirstNet. Go here to learn more about how the Galaxy S9/S9+ will help support public safety. The power of the AT&T network lets you do even more with the Galaxy S9/S9+. With the nation’s largest and most reliable network, you will benefit from a dependable streaming experience. Plus, only AT&T gives you services like AT&T NumberSync, AT&T Wi-Fi Calling, AT&T HD Voice and more. And, with HD Voice capable devices like the Galaxy S9/S9+, you can download free apps like AT&T Mobile Security & Call Protect to help you gain more control over nuisance calls and help you avoid downloading unsafe apps and files. On AT&T Next, consumers can buy the Samsung Galaxy S9 for $26.34 or the Samsung Galaxy S9+ for $30.50 over 30 months.11 Go to att.com/galaxys9 and att.com/galaxys9plus to preorder and learn more about the Samsung Galaxy S9/S9+. 2 DIRECTV: Subscription required. Hardware and programming available separately. Visit directv.com/ app for complete details. Data charges may apply. 3 Nation’s Largest Most Reliable Network: Coverage not avail. everywhere. Based on overall coverage in U.S. licensed/roaming areas. Reliability based on voice and data performance from independent 3rd party data. 4 HBO Included: Add’l charges, usage, speed & other restr's apply. See att.com/unlimitedwithhbo for details. 5 App Pair: Only on select apps. 6 Water and Dust Resistant: IP68 Rating Based on test conditions for submersion in up to 5 feet of water for up to 30 minutes. Rinse residue/dry after wet. 7 Iris Scanner: Not intended to be used as a medical device and the biometric data collected and stored locally by the mechanism is not intended to be used for any diagnostic, therapeutic, or preventative purposes. Please follow all instructions for use of this feature. For more information, please refer to the product Health and Safety Guide. 8 MicroSD Card: Sold separately. Star comes with 64GB of storage. 9 Battery Life: Over one day of battery life based on average battery life typical usage conditions. Average expected performance based on typical use. Actual battery life depends on factors such as network, features selected, frequency of calls, and voice, data, and other application-usage patterns. Results may vary. 10 Wireless Charger: Sold separately. 11 AT&T Next: Requires 30-mth 0% APR installment agreement and qualifying credit and wireless service. Tax due at sale. If wireless service cancelled, device balance due. Service costs additional. Other charges and restrictions apply. 12 $150 Bill Credit Offer: Ltd time offer. Avail. only to qual. business customers. Must purchase new smartphone on AT&T Next®, AT&T Next Every YearSM or an Equipment Installment Plan & activate it w/new line of elig. voice & data svc (min. $50/mo. for new AT&T Mobile Share Flex for Business plan after AutoPay discount; pay $60/mo. until discount starts w/in 2 bills. Other qual. plans avail.) Credit w/in 3 bill cycles. Other fees, charges & restr’s apply. See att.com/150creditoffer for full details. Sprint will launch Samsung Galaxy S9 and Galaxy S9+ on Friday, March 16, with the exclusive benefit of Galaxy Forever. Pre-order begins on Friday, March 2, at www.sprint.com/GS9. Get Galaxy S9 from Sprint for just $33.00 per month with $0 down and Sprint Flex lease (SRP: $792). Galaxy S9+ will be $38.00 per month with $0 down and Sprint Flex lease (SRP: $912).1 More details on Sprint’s pre-order offer will be provided shortly. Sprint will offer three color options – Midnight Black, Coral Blue and Lilac Purple. Exclusively from Sprint, Galaxy Forever lets customers upgrade to the latest Galaxy after just 12 lease payments. Galaxy Forever is included in all Galaxy S9 and Galaxy S9+ purchases. With Sprint Flex, Sprint customers can lease any phone and have the option to upgrade or purchase later. Only Sprint pairs Gigabit LTE capability with HPUE (High Performance User Equipment) to bring our customers a better network experience for Galaxy S9 and Galaxy S9+. Sprint customers can look for an improved experience with streaming videos, mobile gaming and other online apps and services – less latency, faster connections and fewer moments waiting for your phone to catch up with you. With an average of 204MHz of spectrum and more than 160MHz of 2.5GHz spectrum in the top 100 U.S. markets, Sprint has more mobile broad band spectrum than any other carrier across the nation, allowing Sprint to keep adding the capacity and speed needed to serve customers’ increasing demand for unlimited data. Beginning in 2018 Sprint is significantly increasing its investment to dramatically improve coverage, reliability and speed for its customers across its nationwide network and to launch the first mobile 5G network in the U.S. The Next-Gen Network build includes upgrading virtually all cell sites to triband service using 800MHz, 1.9GHz and 2.5GHz, adding thousands of new cell sites to expand coverage, and densifying the network with more small cells to increase capacity and speed. Galaxy S9 can also be paired with no-contract plans from Boost Mobile, giving consumers an additional way to save and find the best option to fit their needs. Available in Midnight Black, customers can purchase Galaxy S9 beginning on Friday, March 16, at www.boostmobile.com. Sprint (NYSE: S) is a communications services company that creates more and better ways to connect its customers to the things they care about most. Sprint served 54.6 million connections as of Dec. 31, 2017, and is widely recognized for developing, engineering and deploying innovative technologies, including the first wireless 4G service from a national carrier in the United States; leading no-contract brands including Virgin Mobile USA, Boost Mobile, and Assurance Wireless; instant national and international push-to-talk capabilities; and a global Tier 1 Internet backbone. You can learn more and visit Sprint at www.sprint.com or www.facebook.com/sprint and www.twitter.com/sprint. 1 Reqs 18-mo lease for well-qualified customer w/new line activation or eligible upgrade and trade-in. Early termination results in full balance due. 2 Compared to similar national carrier unlimited plans. Carrier features differ. HD video streams up to 1080p, music up to 1.5 Mbps, gaming up to 8 Mbps. Data deprioritization during congestion. 3 Limited time offer. 1 Hulu Limited Commercials plan per eligible Sprint account. HD content varies by device and connection. Tablet access via MHS reduced to 2G speeds after 10GB/mo. 4 After 6 months, pay $9.99/mo. for TIDAL Premium. SAMSUNG and SAMSUNG.com are trademarks of SAMSUNG in the United States and other countries. Bellevue, Washington — February 25, 2018 — It’s a bird…it’s a car skyrocketing into space…no, it’s the new Galaxy S9 and S9+, comin’ to T-Mobile (NASDAQ: TMUS)! These two superphones will be the fastest ever in Samsung’s famed Galaxy lineup, and they light up ALL the advanced capabilities – including 600 MHz – on T-Mobile’s network…the fastest LTE network ever! It all starts this Thursday, March 1 at 9:01 p.m. PT when you can pre-order from the Un-carrier and get half off the S9 or $360 off the S9+ via bill credits with eligible trade-in! Both superphones will be available in T-Mobile stores nationwide and online on March 16, and the Galaxy S9 will hit the shelves at MetroPCS on the same date. These two superphones have state-of-the-art hardware that can tap into advanced LTE technologies on the T-Mobile network — including the trifecta of 4x4 MIMO, carrier aggregation and 256 QAM, as well as License Assisted Access (LAA). The Un-carrier has now deployed the trifecta of LTE-Advanced technologies in nearly 5,000 cities and towns across the country, and since the Galaxy S9 and S9+ rock the latest Snapdragon 845 chipset from Qualcomm, they can hit a blistering 1.2 Gbps in laboratory tests, a 20% increase in peak theoretical speed over the Galaxy S8. T-Mobile’s LTE network consistently ranks fastest according to billions of real-world tests from customers on every network, and those same real-world tests show that T-Mobile customers get an LTE signal more often than any other wireless customers. T-Mobile’s LTE network covers 322 million people – nearly every American – and the Un-carrier is bringing coverage to entirely new places with its new 600 MHz spectrum, which travels twice as far and works four times better in buildings. The Samsung Galaxy S9 and S9+ are the first of more than a dozen new 600 MHz capable smartphones set to launch at T-Mobile this year. Made for the way we communicate and express ourselves more with images, videos and emojis, the Galaxy S9 and S9+ both rock Samsung’s most advanced camera ever. Redesigned with a new dual aperture lens that powers an innovative low light camera, Super Slow-mo video capabilities and personalized AR Emoji, the Galaxy S9 and S9+ ensure you never miss a moment and make your everyday epic. The Galaxy S9 is available in Midnight Black, Lilac Purple or Coral Blue for just $30/month on the T-Mobile Equipment Installment Plan ($0 down, FRP: $720), with the larger Galaxy S9+ also available for pre-order in the same colors for $30/month ($120 down, FRP: $840). This deal is available for a limited time. Postpaid voice customers and T-Mobile Business customers can get up to $360 off twelve Galaxy S9 or S9+ superphones. Just trade in one of many qualifying smartphones, and the funds come back to you automatically via 24 monthly bill credits. To be the first to know when the Galaxy S9 and S9+ are available at T-Mobile, sign up at https://www.t-mobile.com/galaxyS9. If you cancel wireless service, credits stop and remaining balance at full price may become due; contact us for details. Limited time offer; subject to change. Qualifying credit, service, & finance agreement req'd. Tax on pre-credit device due at sale. Equipment Installment Plan: 24 monthly payments; 0% APR. Device pricing for well-qualified customers. Device Discount: Must be active and in good standing to receive credits; allow 2 bill cycles. Max 12/account. May not be combined with some offers or discounts. Fastest Samsung based on device capabilities (LTE Cat 18); actual speeds vary. Gigabit-class speeds may require qualifying plan or extra feature. Speeds vary; typical download speed in Q4 2017 was 31.6 Mbps. 600 MHz coverage currently available in 738 cities and towns across 30 states. Rear camera ƒ1.5 lens. Dual aperture on rear lens only. Light comparison based on the Galaxy S8. Galaxy S9 – Measured diagonally, the screen size is 5.8" in the full rectangle and 5.7" accounting for the rounded corners. Galaxy S9+ - Measured diagonally, the screen size is 6.2" in the full rectangle and 6.1" accounting for the rounded corners. CHICAGO (Feb. 25, 2018) – New and current device eligible U.S. Cellular customers who purchase an unlimited data plan can receive up to $350 off when purchasing a brand new Samsung Galaxy S9 and S9+. These devices will be available for presale beginning on March 2. Unlimited plan customers who turn in an eligible smartphone and purchase a Galaxy S9 or S9+ can receive $350 off either device, and those not turning in a device can receive $250 off. * U.S. Cellular’s unlimited plans start as low as $40 per line/month for four lines with no hidden fees, so don’t get hosed on your monthly bill by purchasing a Galaxy S9 and S9+ at another wireless carrier. U.S. Cellular will offer the Galaxy S9 and S9+ in Midnight Black, Coral Blue and Lilac Purple, and they will be available to purchase in-store and at uscellular.com on March 16. Additionally, anyone can visit select U.S. Cellular stores beginning on March 2 to get a sneak-peek of both devices and pre-order. Made for the way we increasingly communicate and express ourselves more with images, videos and emojis, the Galaxy S9 and S9+ drive innovation with Samsung’s most advanced camera ever. Redesigned with a new dual aperture1 lens that powers an innovative low light camera, Super Slow-mo video capabilities and personalized AR Emoji, the Galaxy S9 and S9+ ensure you never miss a moment and make your everyday epic. The Galaxy S9 and S9+ deliver an enhanced entertainment experience with powerful stereo speakers tuned by AKG, with surround sound supported by Dolby Atmos and a refined edge-to-edge Infinity Display2 – a key staple in Samsung’s design heritage. In addition, the Galaxy S9 and S9+ will come with the new SmartThings app, which unites Samsung’s existing IoT services into one single, smart experience. Take your new Galaxy S9 and S9+ to the next level with a Samsung Fast Charge Power Bundle, which includes a Wireless Charging Pad, Vehicle Charger and Portable Battery for $124.99 or $10.37 per month for only 12 months with U.S. Cellular’s Accessories Installment Pricing. U.S. Cellular’s Total Plans with No Hidden Fees - no activation fees, no monthly device connection charges, no phone upgrade fees and no data overage fees - include unlimited talk and text with buckets of 2GB, 6GB and unlimited data, along with family discounts that reward customers when they add additional lines. Customers who refer their friends to U.S. Cellular can earn up to $200 per account when their friends activate a smartphone on a Total Plan. * Prices vary. Offer requires new qualifying Samsung Smartphone purchase on a 30-mo. Retail Installment Contract (0% APR and $0 down), Total Plan with Unlimited Data, new customer port-in or upgrade eligibility and Device Protection+. $350 off promotional pricing requires qualifying smartphone turn-in. $250 off offer does not require smartphone turn-in. Discount comes via a monthly bill credit. Credit approval required. Unlimited Data Plan(s) will stream at speeds of up to 1.5 Mbps and will automatically shift to 2G when each line reaches 22GB. Taxes and charges such as USF and RCRF apply. Accessory Offer: 0% APR, $0 down, 12-mo Retail Installment Contract and credit approval required. Additional terms apply. See uscellular.com for details. 1Rear camera ƒ1.5 lens. Dual aperture on rear lens only. Light comparison based on the Galaxy S8. 2Galaxy S9 - Measured diagonally, the screen size is 5.8" in the full rectangle and 5.7" accounting for the rounded corners. Galaxy S9+ - Measured diagonally, the screen size is 6.2" in the full rectangle and 6.1" accounting for the rounded corners. U.S. Cellular is the fifth-largest full-service wireless carrier in the United States, providing national network coverage and industry-leading innovations designed to elevate the customer experience. The Chicago-based carrier offers coverage where the other carriers don't and a wide range of communication services that enhance consumers’ lives, increase the competitiveness of local businesses and improve the efficiency of government operations. For the third time in a row, U.S. Cellular has the Highest Wireless Network Quality Performance, according to J.D. Power’s twice-annual U.S. Wireless Network Quality Performance Study, and 99 percent of customers have access to 4G LTE speeds. To learn more about U.S. Cellular, visit one of its retail stores or www.uscellular.com. To get the latest news, promos and videos, connect with U.S. Cellular on Facebook.com/uscellular, Twitter.com/uscellular and YouTube.com/uscellularcorp. Preorder your Samsung Galaxy S9 on Verizon starting March 2 and experience mobile entertainment like never before on the best streaming network. What’s more? You can save up to $500 when you switch to Verizon and trade in your old phone for a new Galaxy S9*. Available in two sizes to fit your lifestyle, the 5.8” Galaxy S9 and 6.2” Galaxy S9+ feature Samsung’s stunning edge-to-edge Infinity Display**, powerful stereo speakers, a new dual-aperture lens that powers an innovative low-light camera***, Super Slow-mo video capabilities and personalized AR Emoji. Samsung changed the game when it introduced the Infinity Display, a clutter-free screen that lets you binge-watch your movies and TV shows with no distracting bezels – just a pure, edge-to-edge viewing experience. 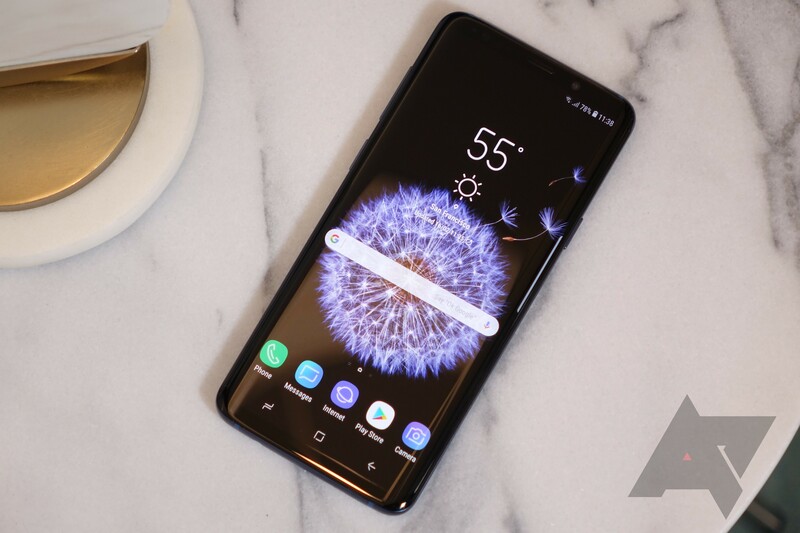 The Galaxy S9 provides the perfect entertainment platform with Verizon’s best-in-class streaming network, especially as more and more people turn to their smartphones to relax. The Galaxy S9 and S9+ go one step further by adding immersive virtual surround sound that envelopes you as you listen to the latest Justin Timberlake record or watch Stranger Things on Netflix. A dual high-powered amplifier offers a richer sound that’s 40% louder than its predecessor. Want to keep your music to yourself? Plug your headphones into the built-in jack and don’t worry about losing your headphone adapter. One of the biggest innovations to the Galaxy S9 and S9+ is the new dual-aperture camera system that lets you capture incredible photos in low-light situations that you can easily share on your favorite social app on Verizon. For non-camera geeks, aperture refers to the part of the camera that controls how much light hits the sensor. The lower the aperture, the more light the camera absorbs, which means you take sharper photos at night or indoors. This is perfect for photographing your kid’s school play or for candid photos at your best friend’s bachelor party. The Galaxy S9+ also includes a new dual-lens camera with optical image stabilization that allows you to take sharp photos, even when you zoom in on the subject. The Galaxy S9+ also features Live Focus so you can choose your subject and select the amount of background blur you want, before you take the photo. The Samsung Galaxy S9 lets you create an emoji that looks, sounds and acts just like you. AR Emoji analyzes a photo of your face and matches it with more than 100 facial features to create a 3D model that reflects and imitates expressions – like winks and nods – for true personalization. You can even share your emojis across most messaging apps. Customize your Galaxy S9 and Galaxy S9+ even further with dozens of new cases available at Verizon from Samsung, Kate Spade, Incipio, tech21 and more. Also, check out the new DeX Pad (available for preorder March 2)****, a docking station for your Galaxy S9/S9+ that gives you a desktop-like experience with the ability to connect an external monitor, mouse and keyboard. Finally, take advantage of the Galaxy S9’s fast-charging with the new Fast Charge Wireless Charging Stand (available online Feb. 25; in store March 2). The Galaxy S9 and Galaxy S9+ isn’t just about fun and entertainment. Under the hood, the smartphones support three different biometric authentication options – iris, fingerprint and facial recognition – so you can choose the best way to protect your device and applications. Samsung also introduced Intelligent Scan, a new verification method that uses a combination of iris scanning and facial recognition technology to quickly and securely unlock the phone in any environment. The Samsung Galaxy S9. Better on Verizon. Verizon is your one-stop-shop for everything Samsung related. Preorder your Samsung Galaxy S9 or Galaxy S9+ on Verizon and save up to $500 when you switch to Verizon and trade in your old phone for a new Galaxy S9*. Looking for a new tablet? Buy a Samsung Galaxy S9 and save 50% off a Samsung Tab E or Tab S3 with new two-year activation. Also, get $150 off a Samsung Gear S3 Classic or S3 Frontier with a new two-year activation when you purchase a Galaxy S9 or S9+ on Verizon device payment*****. Finally, Verizon Up customers with an active Samsung smartphone, will be able to claim an offer in the My Verizon app for $10 off select Samsung accessories. Preorder on Verizon starting March 2. Order your Samsung Galaxy S9 and Galaxy S9+ in Lilac Purple, Midnight Black or Coral Blue starting March 2 on Verizon. With Verizon device payment, the Galaxy S9 is $33.33 per month for 24 months ($799.99 retail price; 0% APR) and the Galaxy S9+ is $38.74 per month for 24 months ($929.99 retail price; 0% APR). Both phones will be available in Verizon stores on March 16. * Up to $929.99 device payment purchase required, port-in & new line activation req'd. $500 = $150 prepaid card and up to $350 trade-in/promo credit applied to account over 24 mos; promo credit ends when balance paid or line terminated/transferred to another plan; 0% APR. Eligible trade-in must be in good working & cosmetic condition. Card mailed w/in 8 wks after receipt of claim at vzw.com/switch. ** Measured diagonally, the screen size for the S9 is 5.8" in the full rectangle and 5.7" accounting for the rounded corners. The screen size for S9+ is 6.2" in the full rectangle and 6.1" accounting for the rounded corners. *** Rear camera ƒ1.5 lens. Dual aperture on rear lens only. Light comparison based on the Galaxy S8. **** Works with compatible HDMI monitors and USB or Bluetooth compatible keyboards and mice. ***** Device payment purchase req’d, plus purchase/2 yr. activation of Gear S3 on same transaction. $150 instant savings off retail price.